Description: CSX Q380-09 departs Collinwood Yard for Buffalo NY after taking on fuel. Description: a slight pan shot. Description: 6 Engines WB on NS Chicago Line @ Fulton St. Description: 6 Engines WB on NS Chicago Line at Fulton St. Description: Ready and raring to go! The M-MEMNTW waits for traffic to clear before it can head for Northtown. Description: Today, NS 174 North has a rare BNSF H1 Scheme locomotive in the consist. Title: BNSF 1113 leads a local south at old monroe. Description: BNSF 7435, 4666 and 1091 leading an eastbound grain train on the bridge over PendOreile lake. 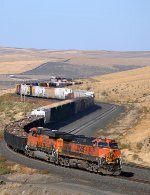 Description: Westbound manifest grinds up Providence Hill and the thru the s-curves on BNSF's Lakeside Sub. between Spokane and Pasco, WA.